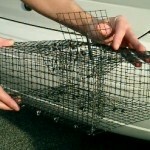 TRAP DESCRIPTION: 4"T x 8"W x 12"L. This trap which is designed to catch and hold crayfish is the smaller of the metal traps. 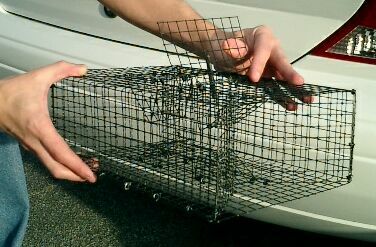 These are all submersible repeating type traps and can catch several crayfish in one set. It features funnel type openings on either end but has the main entrance centered. Once crayfish enter, they cannot escape. The spring loaded release door on top allows for quick release of your catch.